Jammu and Kashmir is one of the states in India that is best known for its cultural heritage and rich craft which has prevailed since a very long time. The famous Basohli Qalam paintings which are kept only in famous museums across the world are found in Jammu and Kashmir. The vibrant culture of the state is also reflected in the paintings costumes and ornaments which are truly world class. One can easily spot the sculptures and carvings of the godâ��s goddesses on the pillars or several constructions especially temples which are a common characteristic of folk art and is equally credible.The art and craft in Kashmir specially is famous for its workmanship. Kashmiri art and craft is admired all over the world for the papier mache, wood work, silk ware, jewellery, floor covering, basketry, metal work, Clays and ceramics, mat weaving, leathers and furs and stone crafting. For the normal households artisans here make different articles of copper ware which consists of cooking pots , sundry articles and samovars. When talking about Kashmir, how can one forget the textile industry which produces Kashmiri shawls, that are not only famous all over India but are also in great demand in international markets. Kashmir is renowned for the vast variety of handicrafts that is produced here. Kashmir has always been a land of great poets and philosophers but one can not only restrict Kashmir to them it also houses some of the great artisans and artists who produce exquisite carpets, gold ornaments, embroidered shawls. Finely chiseled wood work of walnut and oak, silver ware, exquisitely colored and painted papier mache and garments are made of leather and fur. There has always been a misconception among people as they tend to link Kashmiri handicrafts with carpets only but in fact there is much more to Kashmirâ��s handicrafts industry. There are different qualities available in the market to suit every pocket from as low as Rs 10 to as high as few lakhs. People can always find things here suiting there budgets. silk and wool. Finishing of the artwork and the material makes carpet expensive for many, but one can always assures for having a collectorâ��s item in possession because a carpet is a life long investment.Carpet weaving is one of the most expensive and renowned art in Kashmiri handicrafts. The art came from the Samarkand in central Asia and then later on artisans from Iran modified the art of carpet weaving. The person who initially introduced the skill of carpet weaving to Kashmir was Zain-ul-abidn. Many of the artisans and craftsmen who Tamerlane had collected from different parts of Asia went with the young prince to Kashmir after the death of the Tamerlane. During the period of influence of the Mughal emperor Jahangir Carpet industry was given a new direction when a Persian knot style of weaving, was introduced by the Kashmiri craftsmen from Persia. Presently the minimum size of carpet starts from three by five foot and then extends to four by six foot and so on. There are a large variety of carpets some are made of pure wool and those with wool with small percentage of silk or pure silk are used more as decorative pieces than to be used in household normally. If someone wants to find out how decorative Kashmiri carpets are they should definitely go to Kashmiri restaurants where these carpets are used as decorative pieces on wall rather than the painting itself. Kashmiri carpets are very expensive because of the hard work artisans put in to make a carpet. The price for a normal four by six foot carpet of a very good quality falls in the range of few lakhs and if the quality is pure the price can shoot up as twice the original price. But when buying carpets customer should be aware of cheap imitations and duplicate knotting that is used in carpet making. The carpet industry in Kashmir is very wide spread. One can easily find someone on the houseboat selling carpets or someone nearby who owns a carpet factory. The fact is it is almost impossible to avoid carpets. The weaving in these carpet industries is done on hand looms by young boys who are worth seeing. NAMDAS :- Namdas are Less expensive then carpets. These rugs made from cotton and woolen fiber which is manually pressed into shape. These colorful floor coverings are decorated by chain stitch embroidery which is done beautifully by woolen and cotton threads. Namdas are the beautiful floor coverings which are made of woolen and cotton fibers which are given the shape manually and are cheap as compared to other products. The price of namdas depends actually on the percentage of wool used those with higher percentage are sold at a high price as compared to those with low wool percentage in them. 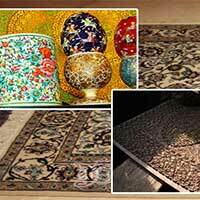 Chain stitch embroidery in woolen and cotton thread is worked on these rugs. Emporiums in Srinagar houses a large variety of Namdas. SHAWLS :- Kashmiri shawlas are known for their quality all over the world. There are generally three types of fibers used in the making of the shawl shahtoosh, pashmina and wool and for the decoration they are embroidered in Sozni and Motifs type embroidery. Pure pashmina is really expensive which in turn makes shawls expensive but if mixed the cost can be controlled. Pashmina is generally spun from the hair of ibex. Shahtoosh is known for the lightness and warmth but is now among the banned items. PAPER-MACHIE :- Another famous product of Kashmir is Papier-mache items. The Papier mache articles are made layer by layer in a mould and in polished and painted with every layer until the desired shape of the article is achieved. Papier-mache is easier to carry. Gold leaf is used in papier mache to make patterns of leafs or other items and the prices of papier-mache is again dependent mainly on the amount of gold leaf used. Prices can range from 10 Rs to several hundred depending on the complexity of the design. It can be made into bowls, cups, containers, jewellery boxes, lamps, tables, letter holders, coasters etc. The production takes places in different stages like molding is done in one place and then it is shifted to other place where painting and polishing is done and then to the place where designing is done. This helps in making the process seamless and easy to handle. In order to see how it is done one can easily visit the Papier-mache industry which area located in villages in Kashmir. LEATHER AND FUR :- In Srinagar shoes or boots or leather coats can be easily made with in few days if someone desires so. Seude coats that are beautifully embroidered are very famous but when it comes to fur trim one has to really be very patient .Fur is generally obtained from animals like wolf, fox, jackal, brown, Marmot and black bear, lynx and leopard that are being hunted in Himalayas by hunters and fur obtained is exported immediately to retain its softness and shiny nature. When buying sheepskin liner or trimmed coats one has to be very cautious because they are sometimes mixed with low quality leather and it is not easily visible to the normal person. So it is always advisable to look carefully before buying. WOOD CARVINGS :- Another interesting part of Kashmiri handicraft is the Wood carving. Complex wood carvings done on houseboats are one such example of the wood carving. It is not very expensive in nature but one can always find ivory incorporated in the design. WALNUT WOOD ITEMS :- The Walnut wood items are made from either of three part of tree the root, the trunk or the branches with three having different properties of their own. Veins are present in the trunks where as there no veins in branches. Branches are light in colour where as the trunk has a very dark colour. The costliest object is those made from the roots because of the kind of wood used. In case of the items made from walnut wood the price is dependent on the amount of the carving artistry done on the object. Walnut wood is kind of soft wood therefore used by artists to carve out chinar leaves, flowers and vine leaves which can be used to carved only on borders or carved on full surfaces. They can be used o make variety of items which include salad bowls, nut bowls, trays photo frames. From small items it can also be used to make big items like dining table with six chairs. In case of furniture made from walnut wood the more the thickness of the wood used higher is the price of the furniture. Two identical chairs can have different prices according to the thickness of the wood used. SARIES :- In Kashmir saris are generally made from silk. Silk farming is practiced in this area where mulberry and silkworms are used to produce quality silk. Though the Kashmiri silk may not be very thick as compared to others but it is strong in nature. Weaving saris is not very famous in Kashmir. It is not practiced on a very large scale. SILKS, TWEEKS :- One of the most important industries in Kashmir is Sericulture and weed weaving. Though astonishing fact is that Tweed being one of the important industries in Kashmir no raw material comes from Kashmir and also not even weaving and printing of silk is done. But the cocoon reared here in state is of high quality which in turn yields extreme fine fibre and the silk hence produced is known as Kashmiri silk. PHERANS:- It is a kind of garment that is a part of Kashmiri way of life and it is worn between a coat and a cloak. It is loose so that it can easily absorb the heat from the burning coals to keep the person warm who is wearing it much like keeping a hot water bottle near to your body. In Menâ��s wear Pheran is made of tweed or coarse wool whereas womenâ��s Pherans are more stylized as compared to men and made of raffles and embroidered at throat cuffs and edges which make them look beautiful. The price is generally dependent of the thickness of the raffel. CHAIN STITCH AND CREWEL FURNISHINGS:- Crewel Work is admired all over the world because of the high quality embroidery. Hook is used in place of needle for the chain stitching be it wool or cotton. With hook work it takes half time as it cover larger area than needle work and is known as â��Ariâ��. Cotton fabric is pre shrink by manufacturer on which embroidery takes place. Tiny stitches cover up most of the area and the figures or motifs used are made with vibrant colours to stand out. The background is in single color made up of coin sized concentric circles which imparts a different look. The key lies in background fabric should not be easily visible.Crewel is basically similar to chain stitch. It is the same as that in chain stitch in which stitching is done on white background but the only difference is the motifs and flowers are not embroidered upon the entire surface and in crewel work wool is used and not much of the colors are used as in chain stitch vibrant colors are used. They are superb household furnishings and can be washed through hand or machine. COPPER AND SILVERWARE:- Copper wares can be easily found in the parts of old city these are generally found hanging on the walls and also cover up most of the part of floor and even ceilings. Samovars, bowl, plates and trays are engraved by craftsmen in these shops.